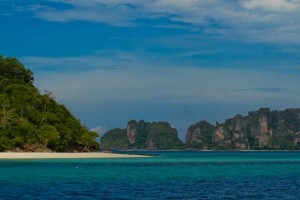 Phi Phi Diving Tours in Phi Phi Island is great all year round and the dive sites are easily accessible. Phi Phi Diving is also a popular destination for dive trips coming from Phuket or Krabi. How to get to Phi Phi! Not only is the underwater world spectacular, also the scenery above the water line in this part of Thailand’s Andaman Sea is amazing with breathtaking limestone cliffs towering over the ocean. The Phi Phi Islands are a natural wonder and a beautiful place you should visit and dive when coming to Thailand. Phi Phi Island is a destination for all ages. If you are young and also like some party the Ton Sai Village is the place to stay. If you like it more relaxed and quiet then stay in one of the holiday resorts on one of the secluded beaches. 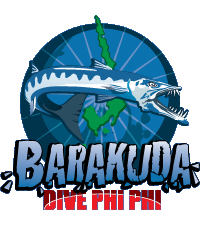 Phi Phi Barakuda is an authorized SSI & PADI Dive Center. The Barakuda Phi Phi Diving Center meets SSI & PADI’s highest standards of quality, safety and professionalism, and is also licensed by the Tourist Authority of Thailand. They met these standards through focus on safe Phi Phi diving practices, first aid, safety equipment, trained and reliable scuba diving staff and environmental awareness. With Phi Phi Barakuda we guarantee the high quality and safety standards that you expect from scuba diving professionals. Prices are in Thai Baht / person and include: Rental gear equipment (3 mm shorty or long suit, 5 mm boots, fins, mask, regulator, dive computer, BCD), tea, coffee, hot chocolate, biscuits, drinking water and a selection of fruit and a lunch (lunch only on 2-3 dive trips). Every Phi Phi Diving day at 08:30 & 14.00 … the MV Oceana is waiting for you ready to go. Everything is set, the scuba equipment has already been taken to the boat, the scuba tanks are filled and standing in line. On Board MV Oceana you cruise slowly out of Ton Sai Bay, along the rough limestone cliffs, leaving the long tail boats & route-cruisers behind you. The water is clear, fishes swim around the boat content, and the boat approaches the first dive site, usually only 30 minutes away from the jetty. 08:00 – Meet at the dive shop. 08:15 – You & staff leave the dive shop. 08:30 – boat leave the pier at Ton Sai Bay. 08:45 – Time to “gear up” for your first dive. 09:05 – Fun divers & DM’s enter the water. 09:10 – Students doing a dive course get ready. 10:15 – End of dive 1. Surface interval of min 1 hour. 11:15 – 2nd dive starts – Fun divers enter the water first followed by dive course students. 12:15 – End of 2nd dive. 12:25 – Boats moves back to at Ton Sai. 13:10 – You back at Barakuda shop. 13:00 – Meet at the dive shop. 13:45 – You & staff leave the dive shop. 14:00 – boat leave the pier at Ton Sai Bay. 14:15 – Time to “gear up” for your first dive. 14:30 – Fun divers & DM’s enter the water. 14:35 Students doing a dive course get ready. 15:30 – End of dive 1. Surface interval starts (min 1 hour). 16:30 – 2nd dive starts – Fun divers enter the water first followed by dive course students. 17:30 – End of 2nd dive. 17:40 – Boats moves back to Ton Sai. 18:15 – You back at Barakuda shop. 07:45 – Meet at the shop. 07:50 – You & staff leave the dive shop. 08:10 – boat leaves the pier at Ton Sai Bay. 09:30 – Time to “gear up”. 09:40 – Dive at King Cruiser Wreck. 10:20 – End of dive 1 – Start of Surface interval of min 1 hour. 11:20 – 2nd dive at Shark Point. 12:20 – End of 2nd dive. Boat heads back to Pee Pee Ley / Lunch. 13:45 – 3rd-dive is local. 15:30 – You back at Barakuda shop. There are 15 different Phi Phi diving sites to dive while you are in Pee Pee Island. You most likely will be amazed at the marine life that you will find there. Turtles, Sharks, Rays, beautiful coral beds & swim-throughs. The dive sites have it all. Phi Phi diving is good all year round, however, the best conditions exist during the months of February up to May. The water temp is approx 30 Celsius and the visibility is normally excellent. End of May to October brings monsoon winds and surface swells to the islands, visibility drops to about 20 meters. It’s unusual for scuba diving trips to be cancelled due to bad weather. One of the best dive sites in the Phi Phi Islands group. It combines hard and soft corals, sea fans and sponges. There is large and small fish life. You can see leopard sharks, black tip reef sharks, and bamboo sharks. Turtles are common as are banded sea snakes. On the walls, you can see giant morays as well and the inquisitive white-eyed moray. Scorpionfish camouflage themselves on corals and rocks. Lionfish hunt around the barrel sponges. Next to Koh Bida Nai, Bida Nok has similar marine life and a few interesting swim-throughs that are full of life. Made famous by the film “The Beach” this bay in Koh Phi Phi Ley is stunning above the water and the beauty continues as you descent the limestone walls. The nutrient-rich waters are a perfect breeding ground for schools of fish. Hawksbill turtles are common hear. Leopard sharks can be seen on occasion. Outside the bay Maya Wall extends in two directions and at the outer edges, black tip reef sharks are numerous. Divers and snorkellers can interact with the sharks in shallow water. In the middle of this bay a small island can be circled in one dive. This is a popular night dive location when the wall comes alive with colorful Christmas tree worms and hinge beak shrimps reflect your flashlight beams. Painted rock lobsters can be seen poking out of crevices and moray eels can be seen free swimming. A submerged reef to the east of Phi Phi Islands. Leopard sharks are common and schools of fish cover the hard and soft corals. Also called Hin Bida this rock 45 minutes south-east of Phi Phi Islands is different to Phuket Shark Point. Leopard sharks congregate here in the sand on the edges of the reef. Also look for moray eels, lionfish, cuttlefish and schools of reef fish. These premier Thailand dive sites are normally dived by Thailand liveaboards but in high season they can be reached by speedboat from Phi Phi. These pinnacles are an excellent place to see Manta Rays in Thailand. For Phi Phi Diving Tours packages please contact us directly and let us know your wishes and needs. If you need accommodation or need transfers to and from Phi Phi Island please let us know and we can offer you a complete headache free Phi Phi Island diving package. Just use our 1-2-go contact form below.